The clamour among environmental groups for protection of the seabed habitats in Lyme Bay arose after a survey carried out for Devon Wildlife Trust in 1991 and 1992 which said the marine life of Lyme Bay was of national, and perhaps international, nature conservation importance. The survey confirmed that about 10 percent of the reefs had been altered by dredging. Local fishermen said that until the late 1980s scallop dredges (steel cages which are dragged along the bottom 12 or so at a time) were adapted to fishing only on the sand and gravel which forms the outer part of Lyme Bay. Then, as other beds were exhausted, fishermen perfected spring-loaded dredges which jumped over the rocks and rock-hopper trawls which made it possible to fish where only anglers had been before. This technological development gave the case for conservation immediate urgency. Inshore reefs of Lyme Bay identified as an area of marine nature conservation interest in A Coastal Directory for Marine Conservation compiled for the Marine Conservation Society by S. Gubbay. Lyme Bay. A report on the Nature Conservation of the Inshore Reefs and the Effects of Mobile fishing Gear, compiled for Devon Wildlife Trust. A series of different reports and studies highlight the nature conservation value of Lyme Bay Reefs, including a list of 27 important areas for marine wildlife (boundaries identified) drawn up by English Nature. 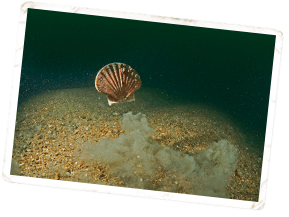 Lyme Bay environmental study carried out by Ambios for Kerr-McGee Oil (UK)as background to exploratory drilling defined location of rocky and stony reef, maerl and eelgrass beds in the bay. Lyme Bay included in the Joint Nature Conservation Committee's Marine Nature Conservation review. Spring: Devon Wildlife Trust initiates Lyme Bay Reefs Project, involving local fishermen in project steering group. Summer: 86 dive sites surveyed, focusing on Beer Home Ground, Saw Tooth Ledges and Lanes Ground. The survey, which was carried out using a nationally recognised methodology, concluded that: "Lyme Bay contains a large number of important and fragile habitats, supporting diverse and abundant communities containing rare species, often at the extent of their geographical distribution range." It also suggested that Lanes Ground and the centre of the bay due south of Lyme Regis were most vulnerable to disturbance. Southern Sea Fisheries Committee investigates feasibility of bylaw to protect reef features. In face of opposition, SSFC conclude voluntary approach more likely to succeed. Following discussions it is suggested that Wildlife Trust, SWFPO and local fishermen develop a voluntary agreement to protect the reefs by closing two small areas, Lanes Ground and Saw Tooth Ledges, to bottom trawling and scallop dredging. Agreement reached in September 2001. By end of the year rising fuel costs, higher prices for scallops and the new development of West Bay harbour allowing overnight stays for fishing vessels made scalloping more lucrative. The number of boats in the bay increased from 9 to 20 with boats travelling from other UK ports to take advantage of scallop stocks. This led to the breakdown of voluntary agreements. Natural England, citing the precautionary principle set out in Defra's marine strategy, applied for a Ministerial Stop Order to close 60 nautical miles of Lyme Bay to dredging to allow damaged seabed communities to recover. In August 2006, the Secretary of State reached a decision with the South West Inshore Scallopers Association to voluntarily close 41.2 square kilometres of the reef area, 'protecting 90 per cent of the area where pink sea fans occur.' English Nature - forerunner of Natural England - and Devon Wildlife Trust challenged the Government's own decision to close 41.2 square kms instead of the 206 sq kms proposed. The breaching of the MSC Napoli in the bay that year reinforced the case for wider ecosystem management. Jonathan Shaw, fisheries minister, told fishermen from 40 boats working in the area that they would no longer be able to use scallop dredges and bottom trawls from July that year. The Statutory Instrument closed 60 square nautical miles of reef, in the largest ever closure of a marine area in British waters to protect wildlife.